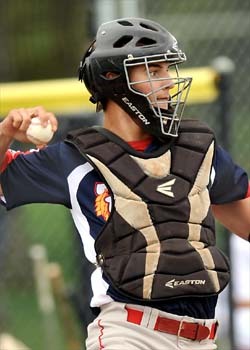 The Cape Cod Summer League has named Kennesaw State’s catcher Max Pentecost (Winder, GA) the Coca-Cola Player of the Week after he set the Cape Cod record for reaching base seven times in a single game. His final at bat sealed the game for the Bourne Braves in the 12th inning as he bombed a walk-off home run. The previous game, Max had another exceptional game as he had three extra base hits, including two doubles and a Grand Slam home run. He sits at .370 this summer with five doubles and five home runs. Pentecost warmed up during the Owls’ regular season finishing with a .302 batting average and three home runs, two of which came in the Atlantic Sun Championship Tournament. Max is one of several Owls that have made bold statements with their play during the summer leagues. Check out http://www.ksuowlhowl.com/baseball/summer-league-2013/ for more on the Owls playing Summer League ball! Posted on July 16, 2013, in Uncategorized. Bookmark the permalink. Leave a comment.